Meet Gadgets: powerful science apps designed to transform your research. Search and discover the Gadgets that meet your research needs. Sign up for a FREE Account and start adding gadgets to your dashboard. Are you getting the most out of the data that matters to you? 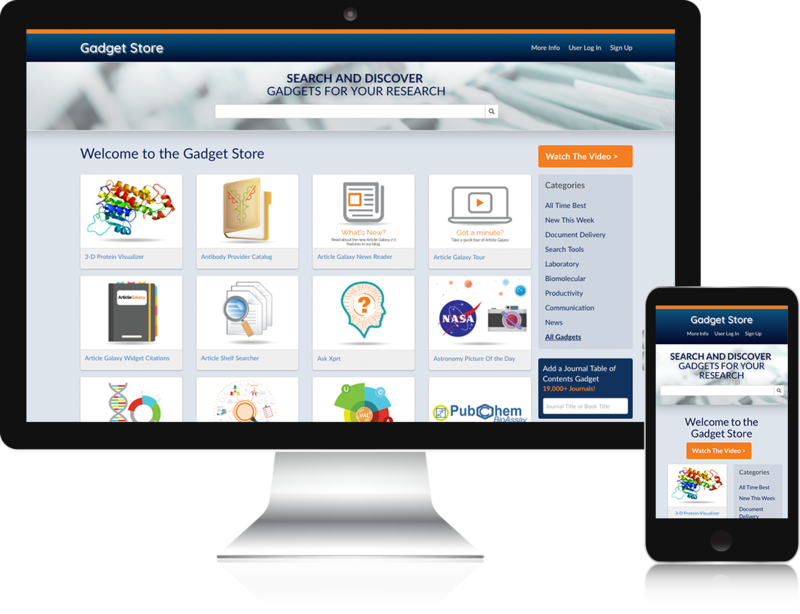 The Gadget Store offers a vast library of easy-to-use apps—designed specifically for scientists and researchers—that help personalize and enhance research. Get access to full-text papers and book chapters from all major publishers 24/7. 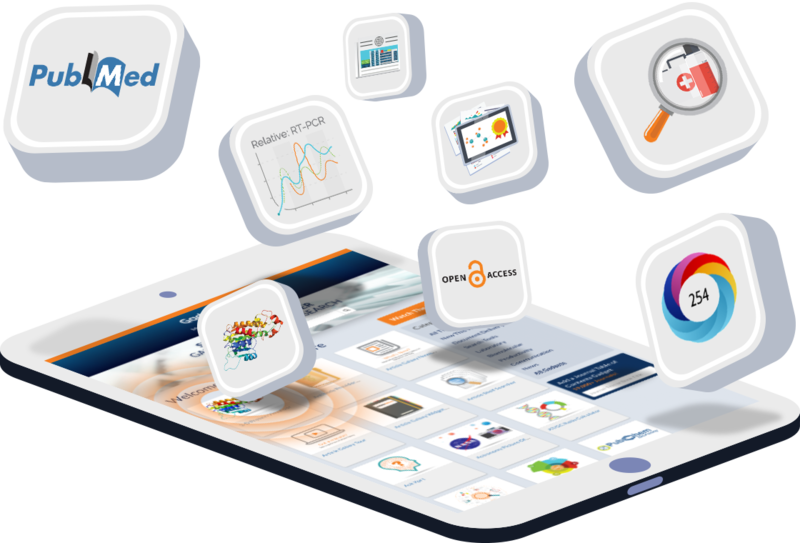 Easily locate bibliographic citations and purchase or rent journal articles on-demand, including Open Access and linkouts to publisher subscriptions. Quickly search for protein structures within any research paper on PubMed. Extract, explore and visualize proteins in 3-D format. Search proteins by one or multiple PubMed IDs or search all related papers based on a protein structure. Determine on the spot if an Open Access version of a particular research paper is available, and navigate to it instantly without need for separate, time-consuming searches. Quickly find and display information related to specific patents. Search by patent title and abstract, publication number, application number, or other details. Narrow down, rank and get access to the most relevant clinical trials based on popularity in online forums and mentions in social media. Find, import and manage bibliographic citations of interest. Easily organize citations into customizable bibliographies and share with other users. Access or purchase peer-reviewed journal articles on the spot. Gadgets are simple yet powerful applications—designed with scientists in mind. Similar to common consumer apps, Gadgets are task-specific and easy-to-use. Far more valuable than simply presenting information, Gadgets pinpoint the data you need for the task at hand, creating a truly personalized research workflow. Use Gadgets to streamline your workflow, accelerate discovery, gain deeper insights—and optimize your research. Managed by Reprints Desk, the Gadget Store offers an ever-growing library of useful science applications. A one-stop-shop for researchers, it’s easy to find the Gadgets that meet your research needs. Each Gadget is assigned a unique, identifying icon. An intuitive interface lets you easily add, move, and delete Gadgets from your dashboard—to create a workbench of Gadgets that’s right for you. Reprints Desk’s ecosystem of Gadgets has the power to transform scientific research. More than just the sum of their parts, Gadgets interact with each other to provide deeper insights—so you can make the most of the data that matters to you. Keep your research in one place with personalized dashboards and easy access to both scientific content and data—in a fraction of the time. Sign up now – and try out the Gadget Store FREE.